When you first started your company, you probably had dreams of wild success and recognition. You were sure that sales were going to pour in, and you would be busy making a lot of money. When you actually operated your company, it probably dawned upon you rather quickly that hopes, visions and dreams alone were not enough. Starting a business taught you that being a business owner is not as easy as you once thought it would be. In fact, it is a lot of hard work with very little reward gained at the outset. This is why small business failure rates are so high. People simply cannot overcome the challenges and demands that come with entrepreneurship. The one word that can be used to describe entrepreneurs who succeed at business ownership is ‘persistent’. You must be persistent if you want to be able to sustain your business through the challenges of entrepreneurship and eventually reap the rewards of a successful business. Entrepreneurship comes with a lot of ups and downs. Sometimes it feels as if you experience more downs than ups as you are in the early stages of business development. This is when your mindset has to remain optimistic and tough if you are going to work through the hardships of building your business. If you are currently having a hard time in your business, you would benefit from reading some quotes about persistence. These quotes will help you realize that you are not the only one who has gone through difficulties as a business owner. Others have been through what you are currently going through and probably much worse. But, they still built successful businesses despite their challenges because they remained persistent. 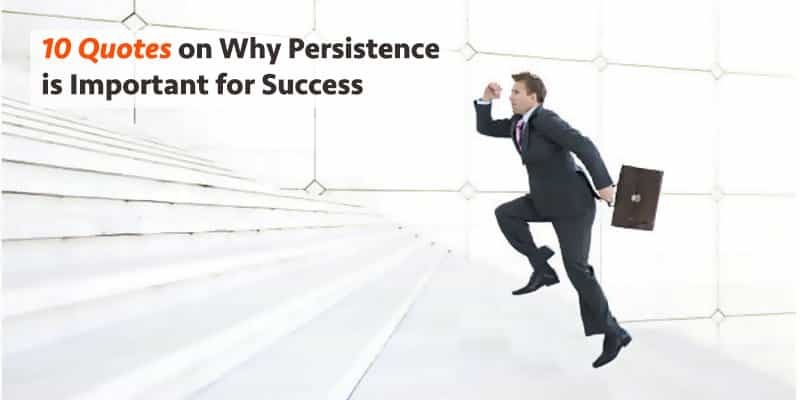 Continue reading to find out how persistence will help you succeed as a business owner. You will have to keep going no matter the obstacles you deal with, and you will need to possess the energy that keeps you going. Building a business is draining. You will be emotional, mentally, and physically stressed as you continue to face new challenges that test your patience. It may be tempting to give up but you will need to keep pushing forward if you do not want your time and money invested to go to waste. This is when you need to dig deep within yourself to remember why you started your business in the first place. You did it to earn more money, live a more abundant life, and to be your own boss. You cannot achieve any of these things if you choose to give up now. The successful entrepreneurs you look up to all faced overwhelming challenges, but they continued moving forward because their long-term success meant more to them than short-term inconveniences. Hard work beats talent every single time. It does not matter what your capabilities are, what matters is how you perform. What could have been being nothing but an excuse? The results you produce are what you are graded upon. You must possess the determination to continue moving forward when you are under constant pressure. This is what makes a minority of people successful and the majority of people mediocre. Successful people know how to rise to the occasion when their best performance is needed the most. You have to be just like Michael Jordan. Whenever the game was on the line was exactly when he put on his best performances because he possessed a strong will to win. You must do the same when it comes to your business by remaining persistent and focused on accomplishing your goals. Along with persistence comes patience. You will need to be aggressive in meeting your goals but you also need to understand that accomplishing big goals take time. This is why you need to break your big goals down into smaller goals which can be accomplished in a couple of days or weeks. This helps you chart your progress, gives you time to assess each and every action taken, and change course if necessary. Rushing things through may not afford you the time to do all of this. As you get used to scheduling your tasks and being patient for results to come in, you create a constant flow of positive reinforcement – considered goal-setting, scheduled tasks, patience and achieving the desired results. You are then willing to keep working hard because you understand that hard work eventually pays off. In this quote, Colin Powell talks about the other factors that are as important as persistence in achieving success. Success takes the time to develop, which means you will go through trials and errors along the way. Instead of giving up due to the mistakes you make, you need to learn from them and improve yourself. You are gaining valuable and knowledge and experience as you work towards accomplishing your goals. This helps you operate at a higher level since you know what to do and not to do to make your sure you are successful. Similar to the maxim ‘Lost the battle, win the war’, this quote teaches us that on the long road to eventual success, you may encounter small defeats and failures. Never be disheartened by these small defeats and keep your eyes on the most important goals. You will be knocked down constantly and told why your business will never succeed. Despite the objections and obstacles you face, you must continue to remain focused on building your business if you truly believe in yourself. The same people who doubted you will be the ones saying they believed in you the whole time when you finally become successful. This is why you can never let the doubters bring you down. They are only doubting your ambitions because they are afraid to take risks themselves. Ambition means nothing if you are not willing to be consistent with your actions and be persistent in operating at a high level. The average person quits after they are not immediately rewarded for their short-term efforts. A successful person ignores instant gratification and understands that success is a long-term effort. You must build up your efforts over time until they align together to accomplish your desired goal. This is why there are so few successful people and so many mediocre people who can only dream of success. Successful people undertake strategic actions and persist at them, while mediocre people lack the stamina and persistence to see things through. You can never become complacent on your journey towards success. Yes, you will face stumbling blocks but they cannot paralyze your actions. You must learn to continue moving on despite the setbacks you have experienced. Steve Jobs was fired from his own company. Michael Jordan was cut from his high school basketball team. Despite these setbacks, both men went on to do extraordinary things in their professions. This is because they persisted. They never allowed the opinions of others to define how they operated. Their only objective was to prove themselves right, while proving wrong those who doubted their abilities. This quote from Churchill is very insightful. When you are surrounded by setbacks, failures and obstacles, it is sometimes easy to just wallow in misery and give up. That simply doesn’t make sense, as Churchill noted. You have to keep on moving, planning your next actions and acting on them with confidence and peristence. If success were easy to accomplish everybody would be successful. You have to be willing to weather the storm and remain focused on your vision if you are going to make everything you went through worthwhile. It would be crushing to learn that you quit when you were a step away from producing success. This is why you must keep going no matter what. You do not want all of your hard work to go to waste. Nobody was born a champion. They kept at it, hour after hour, day after day, repetition after repetition, till they get it right. It does not matter if you make one mistake or many mistakes. What matters is that you learn from your mistakes and improve your performance. Success is a journey that many people have no patience or guts for. You will need to have both if you want to finally meet your destination of success. The next question may be if you are doing the right things. You cannot give into your own self-doubts, though. You have to remain strong and be your biggest motivator because not many people will believe in your vision. Somedays it will feel as if you are making great progress. Others days it will feel as if you have not accomplished anything. These are the days when you can get easily discouraged. You just have to remember that consistent action is better than no action. The momentum will keep building every day, no matter how little you do. Having this mindset is also very realistic, as none of us perform at our very best every single day of our lives. The moment you stop pushing forward is when you let all of your efforts go to waste. The quotes above are motivators on your journey to entrepreneurial success. Print them out, note them down, memorise them, and most importantly, act upon them. The moment you achieve your dreams, you will realise that none of it would have come about without persistence. We are excited to help your business get the most out of our services. Looking for Singapore Company Registration, Tax and Accounting or any corporate services?